Pint-sized singing sensation Connie Talbot is taking on music giants Take That, Spice Girls and Leona Lewis in a race to the top of the Christmas charts. The gap-toothed youngster, who just turned seven, looked relaxed on the eve of the big release of her album 'Over The Rainbow' which hit shops today. The 3ft 9ins performer stole the hearts of the nation earlier this year when she performed on ITV1 show Britain's Got Talent, winning over hardened judges Simon Cowell, Amanda Holden and Piers Morgan. They put the youngster through to the finals, in which Connie battled for a £100,000 recording contract and a spot on the Royal Variety Show. Viewers fell in love with her performance after she sang Somewhere Over The Rainbow, made famous by Judy Garland in The Wizard Of oz ..
Connie had been practising her singing since the age of three when she used to perform for her grandma. But she was beaten in the final by opera singer Paul Potts, who will sing for the Queen next month and already has an album out. Connie was signed up by Simon Cowell but was later dropped by the music mogul after a record company decided she was too young to be a recording artist, but last month Connie was signed up by a rival company. Proud mother Sharon Talbot, 38, of Sutton Coldfield, Birmingham said: "All the family is really excited, but Connie is quite blase about it. "She doesn't seem that excited. It's probably because we've been playing the album quite a lot at home and she's got used to it." As some of you know, I'm a hard-bitten old cynic and you can believe this or not, but until today, I'd never heard Connie Talbot sing and I've studiously avoided all Internet articles about her including this thread. Hype! has been my attitude to the Connie Talbot story - or as my old grandad Scrooge might have said "Bah! Humbug!" I see many potential traps ahead for Connie and I hope they can all be avoided but for the moment, I'll stick to that one word exclamation I just made. Looks like Connie has sold 100,000 albums in the UK since it has been available for sale... Belinda do you know when the album became available - was it the 26th of Nov? Amazing. Yes it was the 26th November. Incidentally, you can't find a copy at all round my way. They fly off the shelves as soon as they're put there. Over The Rainbow sold 21,000 copies in the shops last week (its release week) and is expected to sell at least the same or probably a few thousand more this week due to the pre-Christmas rush. Of course, record companies press CDs, ship them to the shops and immediately tell us they've sold that number before they've even sold a single copy (to the public!). I'm sure there are by now around 100,000 copies of it in shops and warehouses... but less than half are so far sold (sometimes I hate record companies LOL). They'll all be gone by Christmas day though. Hi Belinda, it's OK, she'll have sold them all by Christmas! Well, I've now played the album and first, I'm going to swiitch into critical and highly unfair mode - I'm going to compare her with adult singers. In absolute terms, i.e. compared to an adult singer, her voice certainly has faults - some of them show up in the Silent Night YouTube clip you posted, Belinda - such as limited range (compared to an adult!) making her jump rather abrubtly into/out of her head voice/'falsetto' or whatever it is at her age. But on most of the songs, that is absent and most tracks are very enjoyable even when compared with adult singers who've recorded them. The feeling she puts into it is also, obviously not as good as most decent adult singers. The surprising thing is that at her age, she can put any feeling into it at all... but she does, lots of it, in quite a few of the songs. Occasionally her voice reminded me of a young Michael Jackson! But her ability to hit the notes , her "perfect pitch" if you like, is as good as many professional classical crossover singers and better than most pop singers I've heard. It's astounding in fact... and that's when comparing her to adults! When you compare her with any child under the age of ten that you've ever heard, and try to describe it, you quickly run out of superlatives so I won't even try. 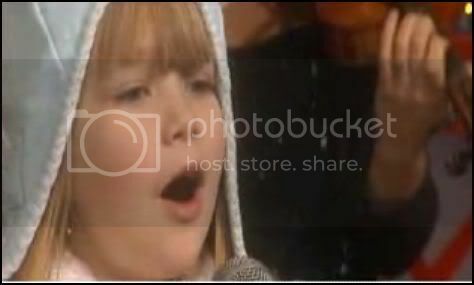 Suffice it to say that the judge who described her as the best 6 or 7 year old singer in the World was probably right. She could even be the best one ever at that age - and you know what that implies - gosh, did I really say that? If her development is handled right, she could turn out to be quite some singer in years to come - but that aspect still concerns me, her handling and future development. But leaving that aside, for a young child singer, she's totally out of this World so I'll say it again... wow! PS: what I really love about Connie is that she makes me smile every time I'm listening to her music... I like smiling! of course she has some faults,So do most singers. She has many years ahead to master her craft. You are most welcome. I am delighted to hear that the CD arrived just in time for Christmas! Thank you very much for your ecard by the way and Merry Christmas to you too! The question has been sitting unanswered for a while, and also she is beginning to get attention in the American media, so I thought I would take a shot at it. While it may seem cruel to evaluate Connie by comparing her to adult singers, I don’t think that any other approach is fair to her in the long run. She has embarked on a career in an industry which can be cruel - at a disturbingly young age. While it is true that people will tend to cut her some slack for now, the bar will raise rapidly as she gets older. If she doesn’t show a constant improvement in the next several years, for example, there is a serious danger that people will begin to dismiss her as just another novelty act. The problem with being a prodigy is that it has a shelf life. It is not that I find Connie unimpressive. But it is one thing to be amazed by what she can do at her age, and quite another to try to project where she is to what she might become. You simply cannot make that projection at this time. Her voice is going to be subject to too much change to make that leap. For example, right now, two things are striking about her to my ears. One of them is the ability to hit pitches with relative accuracy. The other is sibilance - singing through an immature vocal structure. Both are problematic. It is impossible to get an idea of what she is even going to sound like when her vocal structure matures. In fact, depending on how it goes, there is no guarantee she will keep her vocal accuracy either simply because it is harder to control a bigger voice. It is much the same situation as a six year old who can run faster than any other six-year-old and trying to project from that whether or not they will become a world class athlete. She could injure a knee tomorrow….. While I have no evidence that this is the case, in any situation like this I fear exploitation. I also fear the effect that stardom at such a young age might have on her. People are different, families are different, and therefore there are probably as many possible reactions to this as there are people - but it is no coincidence that a rather high percentage of child stars come to some grief. There will be strains placed on Connie, and on her family which are simply not a part of ordinary lives. It is hard to get your head around the fact that when a child becomes the primary wage earner in a family that it can completely destroy the traditional family dynamic. This is particularly dangerous when the family didn’t start with much money. In the best of cases some decisions have to be made by the child who may be forced to decide things years before theie judgement centers are prepared to do that. There may be pressures on her behavior, and body image years before she is ready to handle that as well (There are whispers in the American media that Abigail Breslin needs to lose weight. She is 11 - and not particularly big for her age…..). All we can do is wait and see what happens we have no control over any of it.